Euroquatics, a wholly owned subsidiary of horticultural lighting giant Gavita Holland, and Transcend Lighting, the world leader in LED grow light technology, teamed up to announce the launch of E5 aquarium light lamps. With numerous capabilities and features, these highly efficient new lamps can be used in place of traditional T5HO aquarium bulbs. Euroquatics plans to introduce the E5 at the 2015 Reef-A-Palooza show next weekend (October 10 and 11) in Costa Mesa, CA. Euroquatics made waves in the industry last year when they unveiled their Angel LEDs at the 2014 show. 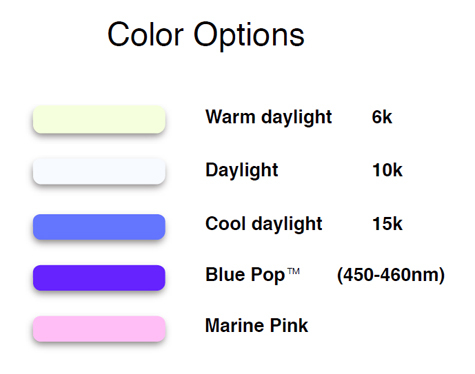 The E5 lamp will be available first (in limited quantity) at MarineDepot.com later this year. The E5 is designed to work in sync with your original T5HO fixtures. These unique products showcase features that create an eco-friendly, longer lasting aquarium lamp. This new spin on an old design makes T5s a product of the past. With its sleek design, the E5 is made to last over five times the life span of an average T5HO lamp while consuming about half of the power. 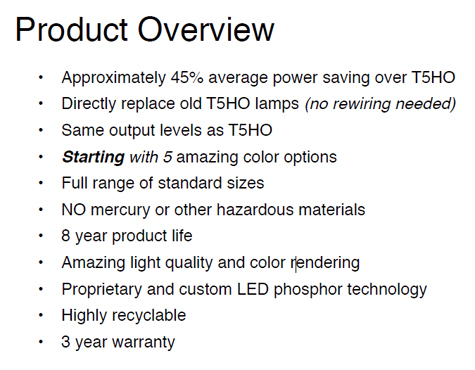 T5 lamps are also comprised of toxic materials that can be extremely harmful to the environment if broken. In addition to a decrease in power consumption, the E5s are made to the highest industry standard from highly recyclable materials. These custom-phosphor LED technology lamps are RoHS (Restriction of Hazardous Substances) compliant and do not contain mercury or other toxic materials. Bogner says Euroquatics is trying to push the industry forward in both options and quality. Although certainly subject to change, Euroquatics says the pricing of their new E5 lamps will be around three times higher than a quality T5HO florescent bulb but will have 8-10 times the life. 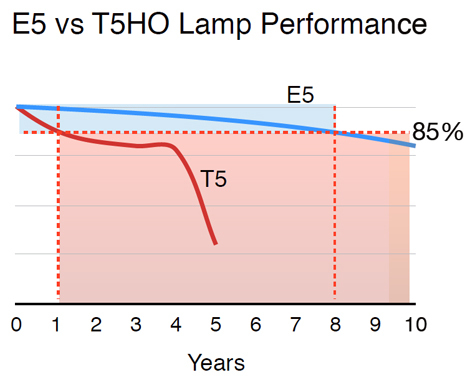 And, when you factor in the 45% power savings and the replacement costs every 9-12 months for standard T5HO bulbs, over time, the savings are huge. READ We want YOU to join the Marine Depot team! Bogner also revealed Euroquatics has been working on additional sizes and colors and will release ongoing updates between now and the end of the year. 4For updates on the availability of the E5 lamps, please like MD on Facebook. 4Visit our store to see our current selection of Euroquatics LED aquarium lights. 4Watch these videos to meet Scott Bogner and learn more about Euroquatics Angel LEDs.